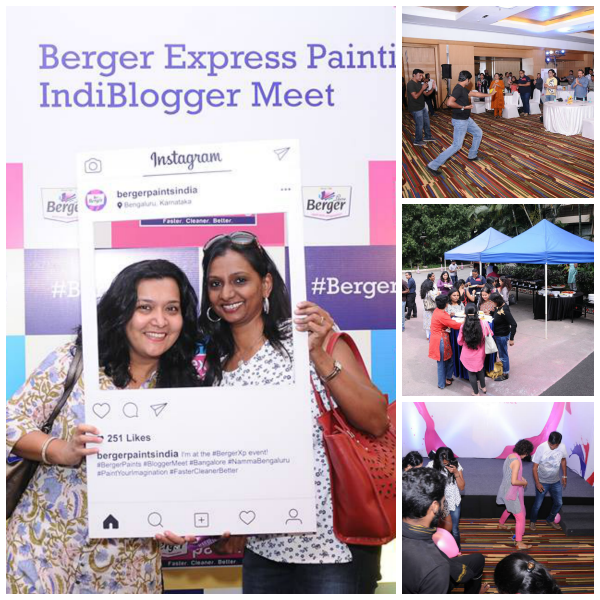 When I first saw the invite for the #BergerXP Indiblogger meet, I chuckled to myself. As someone as art challenged as I'm, it felt a bit weird to attend a meet that was associated with painting. Of course, I reasoned, this was wall painting and not the canvas kind. Plus, I was being invited as someone who blogs not paints. 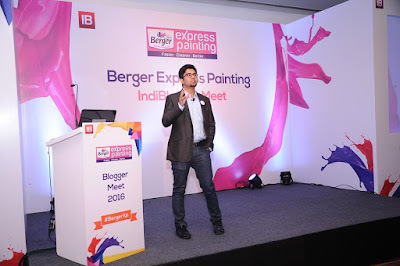 This was going to be my first Indiblogger meet. I was excited even though I had no clue what to expect. I was jittery too since walking into a room full of strangers isn't exactly my cup of tea. 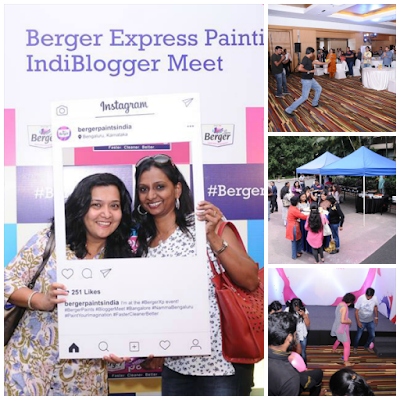 However, the last part wasn't a valid concern because it turned out that a lot of bloggers I knew had signed up for the event. Technically, I was going to be meeting them for the first time as well but I had known them for long enough through their blogs and the prospect sealed the plan for me; this was surely going to be a memorable event! Perhaps, I spoke too soon. For, life managed to insert a spoke in the wheel at the last minute. Ok, don't groan. I'll spare you the details. Suffice to say that after a nail-biting scene of "will I make it or not", I was relieved to sit in the cab that would take me from my end of the city to The Lalit, the venue of the event. Yes, I hear you sigh in relief. I did too, that day. Battling the famous Bangalore traffic, I landed up almost an hour late, right in time for lunch! 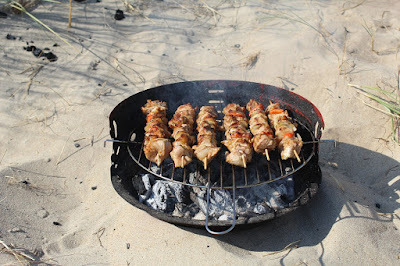 And, boy, was I glad to see my blogging group munching there and happily chattering away? You bet! We hit off right away and caught up with pleasantries and some more over bites of bland paneer, face-saving gravies, and finally, a couple of good desserts. Like a bunch of teenagers, we giggled over the selfies and groupies and entered the room set up for the event. The crowd seemed pleased to see our anchor for the day, Anoop. I was to soon realize why as he steered the show naturally with his hs infectious energy and humour. Kartik pitched in with his zen-like moves to shake us off from the lunch induced lethargy. We replicated the moves clumsily but the trick worked. Next, we were made to skittle around with inflated balloons tied to one leg with a loose thread. The idea was to safeguard your own balloon while you went about bursting the ones tied to others' legs. The madness and laughter that ensued ensured we were alert enough when Mr. Chandranath Banerjee, the Service head of Berger Express Painting, took center stage. Mr. Banerjee briefed us about the features of the express painting solution by Berger Paints India, the advantages it scored over the competitor brands, and the benefits it brought to the end consumer. Painting the house always brings in unpleasant memories of the dust flying around in the house, the chaos and mess caused by the displacement of furniture and functioning of the house. Not to mention the back-breaking after-work of cleaning and tidying up. If you're finicky about routine and cleanliness like me, you might want to schedule re-painting your home for the distant future. So, I was pleasantly surprised to hear that BergerXP (Express Painting) takes these concerns by the horns and offers an unbelievable solution. The painting is done by certified painters who use sophisticated tools to paint minimizing the total time taken by almost 40-50%. The cutting-edge vacuum suction-enabled sanding machines keep your house dust-free and give a smoother and better finish. The tools like sanding machine, auto roller, and airless paint srayer used for the process ensure that there's no paint spillage over your prized possession even as the professional experts do an excellent end-to-end job of covering your furniture with plastic sheets and readying the room after the work. We were shown short video clips of how the job is done and testimonies from satisfied customers. But, the icing on the cake is the fact that all these extra benefits come at no extra charge to the customer! Unbelievable, right? The reason is that more than 50% of the painting cost is taken up by the charges paid for the manual labour involved and since this innovative solution cuts down the efforts with automotive tools, the overall cost is off-set. The fact that the company has chosen to let the end-consumer benefit from the cost-effectiveness shows its sincerity towards its loyal customers. I must say, I was impressed. Mr. Banerjee patiently and satisfactorily answered all the queries we had. 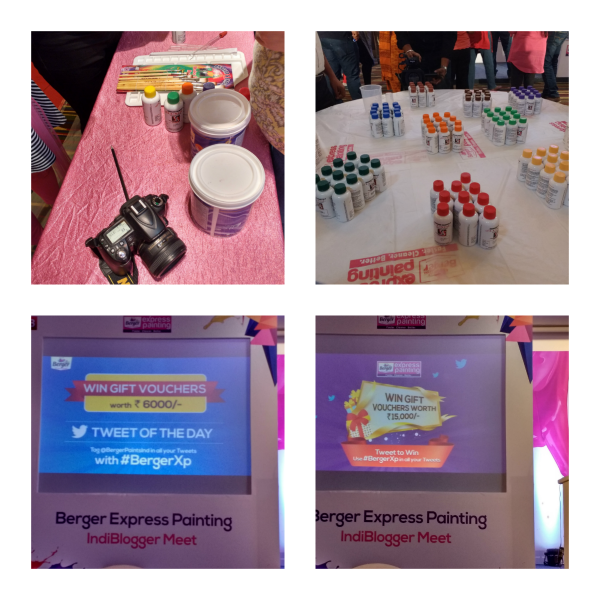 I gleaned useful bits of information such as even if I have just a room or a wall to be re-painted, choosing Express Painting by Berger will be cost-effective for me. Also that, it would be better to paint the entire surface as opposed to choosing to do a spot-touch up for better aesthetics. All through the presentation, we were encouraged to keep tweeting out the information. The more creative we could get with the tweets the better, we were told, since there were exciting gifts to be won. There was more to the fun part. 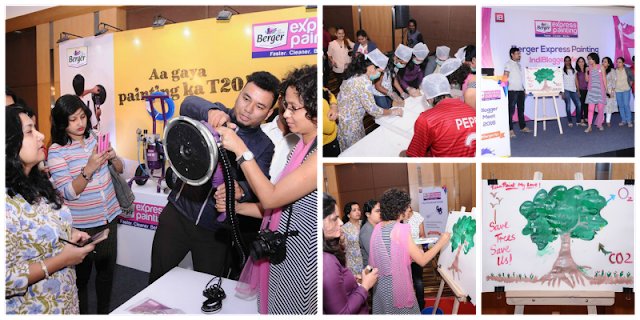 The crowd got divided into six teams and each of us had two tasks to be accomplished. The first was to sandpaper a block of wood to make it smooth and free of any uneven patches. The second was to choose from a given set of themes and paint a canvas using the ready paints, stainers, and brushes. Both the activities freaked me out. Getting soaked with all the dust that will fly off during the first wasn't really my idea of fun and how could I possibly contribute to the second: someone whose paintings can be compared to a toddler's scribblings? Armed with masks, and head covers our team set off on task number one. And,how wrong I was! I thoroughly enjoyed myself. We kept pulling each other's legs, laughed till our sides ached while also warding off distractors from the other teams. We completed the given task much within the stipulated time although the results of the competition were yet unknown. In the meantime, we readied ourselves for the painting activity. Our team lead, Madhumita, had a clear vision regarding the theme and approach. We called ourselves "Paint my love" and chose to depict a picture about the need to save our environment. Apart from handing out the right brush and appropriate colours to the more capable members of the team, I helpfully kept out of their way. Post a short coffee/tea break, we came back to a wind-up session that included announcing the results of the above tasks. The judges combined the results of both the activities and awarded two prizes. We were thrilled to discover that our team won the runners-up place. We signed off with yet another rib-tickling game of playing the mannequin that had us taking our favourite pose and standing still for one whole minute. Phew! never did a minute felt that long. We struggled to not burst into laughter what with all the funny poses people chose for themselves. Smiles on our faces intact, we left saying our goodbyes, already looking forward to the next Indiblogger meet. I, for one, have decided to be a regular at these. I've been seeing such happy pictures of all of you that it makes me very very envious. So did your cleanliness OCD take a beating during all that sandpapering ;-)? U guys surely had a great day Uma. Saw the lovely pics of u guys and the gala event. We did have a great time, Ramya! Seriously, Soumya but I surely hope to meet you soon! It was fab to meet you! aah...now you do know how to make someone smile :-) It was great to meet you too!